IP and CCTV cameras used to be incompatible technologies, but thanks to the innovation of Video Save’s new CES 2 server, IP and CCTV cameras can now be used interchangeably. IP cameras have long enjoyed the advantages of ease-of-use and ease-of-wiring. They are also easy to implement, because the camera simply plugs in to Internet cabling which is often already installed and available. Historical drawbacks of the IP camera are the inability to store and manage the video and the difficulty of integrating the IP camera into conventional surveillance infrastructures. The new CES 2 server, by providing video storage and easy integration for both IP and conventional CCTV camera types, removes storage, management and integration as an IP camera limitation. VideoSave’s new CES 2 server runs on 120- 240V 50/60 Hz AC power. The server is expandable to accommodate 1″ 18 conventional CCTV cameras and provides an Ethernet socket for receiving video from up to 20 digital IP cameras. In operation, the server converts all incoming video regardless of the source to the MPEG-4 format to minimize storage capacity requirements for archiving and bandwidth for viewing. ONSITE/OFFSITE STORAGEConventional surveillance systems are based on digital video recorders (DVRs) that store CCTV video on their internal digital hard drive. The new CES 2 server, of course, provides CCTV storage, and also stores IP camera video. What’s more, in another industry first, the CES 2 server gives users the choice of storing video locally, or sending critical video to VideoSave’s offsite video vault. 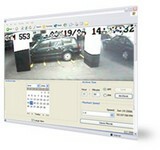 The user decides which cameras merit secure offsite archival and which will use onsite DVR-like storage. Clients with legally critical video benefit from the offsite video vault’s 24/7 security. Their video assets are encrypted and placed under the management of VideoSave’s I.T. professionals. Video vault storage puts CCTV video beyond reach of tampering or sabotage, preserves forensic video despite fire, hurricane and other disasters. Unlimited storage capacity enables clients video assets to be stored for multi-year periods, covering legal statutes of limitation”a vital benefit in high stakes litigation! Offsite storage, under professional I.T. management, also confers third party provenance and legal chain of custody for the stored data. Now, we can integrate IP cameras from a number of vendors (including Axis Communications, Panasonic, etc.) with conventional CCTV cameras, and present all the video seamlessly. says Steve Shaer, CEO. Also, for the first time, clients can choose between low cost onsite CES 2 video storage and high security storage in our offsite video vault, he says. Video Save is offering discounts to AAOA members. Find out more by emailing aaoa@videosave.net. Not an AAOA member? Sign up now and start saving on all the things a landlord needs!